I don’t intend to offend anyone with what I’m about to say, but I cannot stand to see Oreos stuffed into cookies or baked into the bottom of a cupcake. I believe that Oreos taste best simply dunked in milk, although I won’t complain about Oreos being used in cookies ‘n cream ice cream. Oreo truffles are even becoming borderline unacceptable to me. Other candies and sweets being stuffed into things like brownies, cupcakes and cookies are also becoming extremely boring and just too much for me. Butterfinger cookies, for example? I don’t think so. And although I love Reese’s Peanut Butter Cups nearly as much as my right hand, I don’t want to see them baked in brownies or cookies. Easter egg chocolate bark? Cute, but just too much. I’ve seen some pretty crazy food lately that involve commercially prepared sweets and I have to wonder where the actual creativity is in that. Sure, maybe it tastes good, but in my opinion it’s just too boring. Recently, on Twitter, I declared that I was boycotting Oreos. I had seen something with Oreos in it (can’t remember exactly what it was though; it may have been an Oreo spread) and it just made me feel sick. Nearly every time I see a photo on FoodGawker or Tastespotting with Oreos in it, I can’t help but shudder. I had had enough and decided to never use Oreos in my baking again. I’d only use them in the exact same way I grew up using them – dunked in milk and gobbled up! But oh, delicious. magazine, what a dilemma you caused me with your April 2012 issue. There was an article in this magazine featuring “wicked” chocolate recipes from Trish Deseine, including a no-bake chocolate cheesecake, a guinness chocolate cake with creme fraiche frosting and a chocolate peanut butter tart. Well, okay, that last recipe is actually called an Oreo And Peanut Butter Pie, but I’m pretty sure it should be a tart and not a pie. And yes, the tart features an Oreo-crumb crust. Well, okay, I can handle an Oreo-crumb crust. I decided to make it, but if I could find a chocolate cream sandwich cookie that was not an Oreo, I’d use it instead. But no, the store didn’t even have Arnott’s Delta Cream cookies, so I had to buy a couple boxes of Oreos. Sigh. I believe I winced as I picked up those Oreos in the store. I just had to take comfort in the fact that I was using them for a simple crust, not for something like birthday cake Oreo-stuffed brownies. Anyway, on to the pie tart. As I’ve already made known, the crust is crumbed Oreos mixed with melted butter and pressed into the bottom of a tart tin. The filling is a simple combination of crunchy peanut butter and icing sugar. The topping is a dark chocolate ganache made with unsalted butter. Melted chocolate, you have really caused me some problems lately. You may recall that we recently moved houses and I had to buy all new pans to use on the new induction stovetop. Previously, I melted chocolate in a heavy-bottomed saucepan over very low heat on a normal stove and I’ve never, ever had problems with seizing the chocolate. But trying to melt chocolate this way over this induction stove has seized my chocolate 3 times in a row. I know there was no water in the chocolate, so it was obviously due to overheating the chocolate – the induction stove just heats up too quickly and I’m not used to that yet. Laziness was also an issue, as I realized I wasn’t chopping the chocolate in small enough pieces so it would take longer to melt, in turn, making the chocolate hotter. Shameful! It still tasted fine, but I just couldn’t deal with the grainy appearance of it. Seized chocolate is really, really ugly. And only a couple of weeks ago I was making my own version of Cherry Ripe cupcakes and seized the chocolate I was making for the frosting. I was really fed up by then! I finally bought my first stainless steel bowl to use to melt chocolate in over a pan of simmering water. 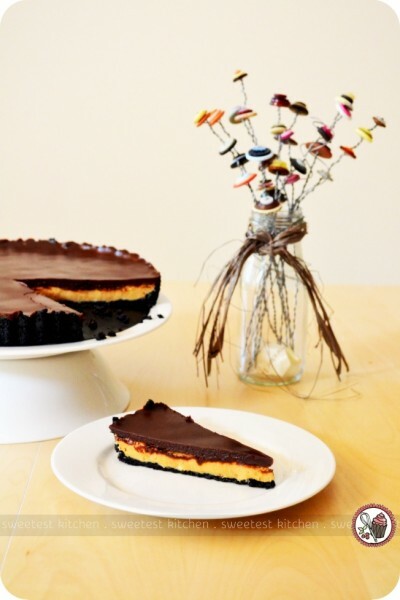 The first chocolate I melted in it was for this chocolate peanut butter tart and it turned out nice and smooth. I was really disappointed in myself for ruining so many batches of chocolate ganache, but I think that’s over now that I’ve finally started melting chocolate like it’s supposed to be melted – in a bowl over a pan of simmering water! 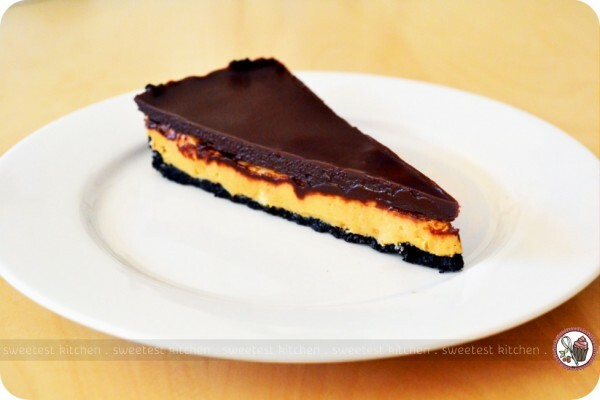 To return to the matter of this chocolate peanut butter tart that looks so delicious and decadent… it was indeed delicious but extremely rich. I found the peanut butter filling to be too sweet and if I were to make this again (which is a slight possibility) I’d probably reduce the icing sugar and try adding a bit of sea salt flakes instead. 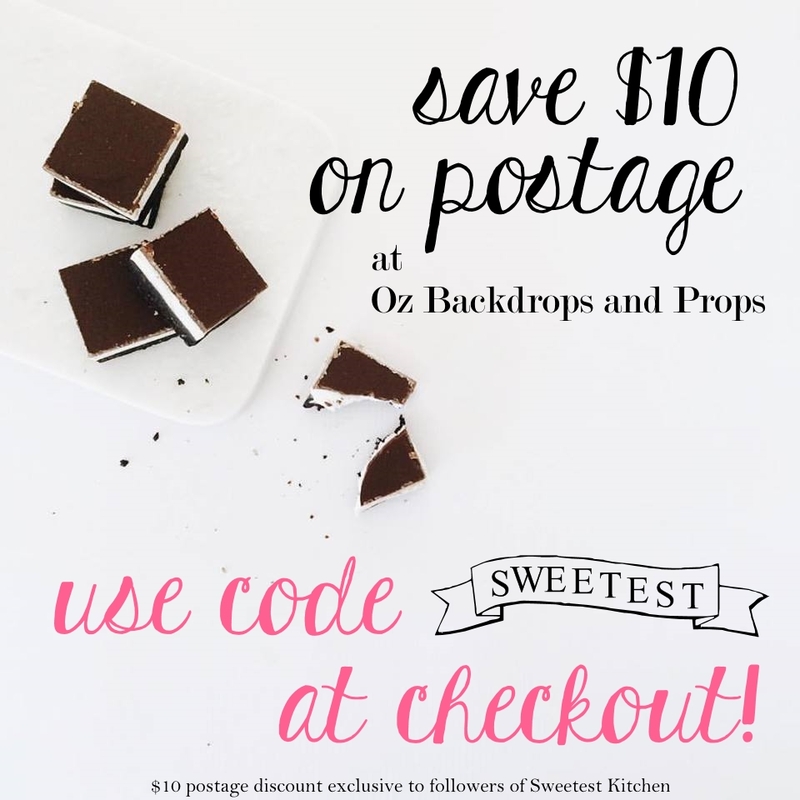 No matter how you make it though, it is sure to please the chocolate/peanut butter lover in your life! 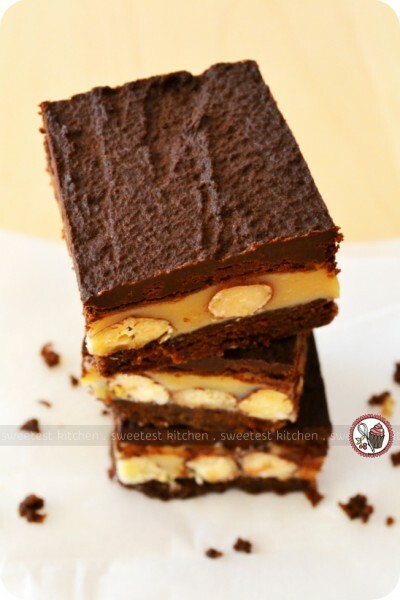 Before I hand over the recipe for the tart, I am interested to know what others think of the current trend of using Oreos and sweets to “stuff” cookies, brownies, bars, etc.? Are you a fan of it, or do you think it’s uncreative, boring or sickening? 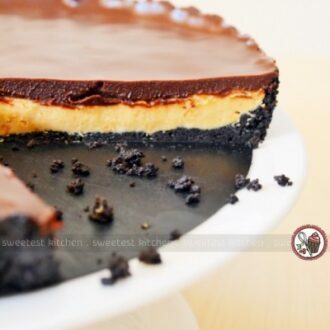 Chocolate peanut butter tart, with an Oreo crust, crunchy peanut butter filling and a top layer of chocolate glaze. Finely crush chocolate cream cookies in a food processor. Melt 75g of the butter and combine with crushed cookies. Press mixture into the base and sides of a 24cm loose-bottomed tart pan and chill for 30 minutes, or until firm. Combine peanut butter and icing sugar in a bowl and spread into the tart base. My filling was quite firm and what I found easiest was putting chunks of the mixture on top of the crust and then very gently spreading it out with my fingers, smoothing out the top. Place chocolate and remaining 100g butter in a clean bowl of a pan of simmering water (don’t let the bowl touch the water). Stir until melted, then cool slightly. Spread over the peanut butter layer. 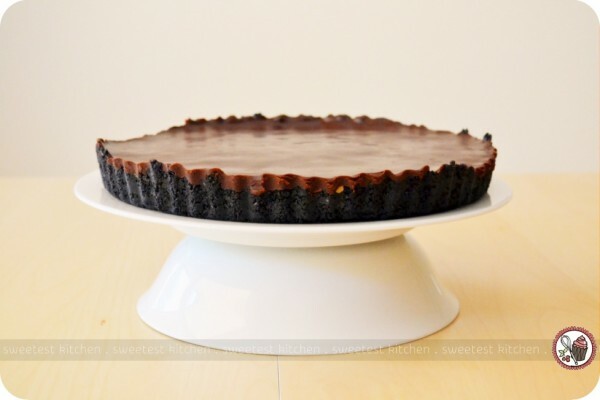 If you’d like a smooth top like mine, pour the chocolate over the peanut butter filling and gently lift and tilt the pan so the chocolate covers the entire tart – don’t use a knife or spoon to spread or you’ll end up with lines in the chocolate. Chill for 30 minutes, or until firm. My tart stayed nice for around 3 days, stored in an air-tight container in the refrigerator. Bring to room temperature, if desired, before serving, but it tastes nice cold too! Lovely tart! It looks rich and tasty. Plan to make it but I have one question. Do you crush the Oreo including the cream or do you scrap off the cream before crushing them in the food processor? I totally agree with you about processed food-in-baked-goods overload. I am so sick of seeing oreo everything! Nutella is quickly becoming my nemesis as well. You make a good point-there is no creativity in adding candy to cakes and brownies. It’s not only cheating, its just plain disgusting! This, however, looks great and I am also not opposed to cookie crusts. Newman-O’s is an oreo cookie copycat but without some of the nastiness in regular oreos. Doesn’t get any better than chocolate and peanut butter! This is my kind of tart! I don’t think it would work quite as well. Nutella is much sweeter than peanut butter, so I wouldn’t even think you’d need to add any icing sugar at all, but that means that the Nutella will be very soft and you wouldn’t be able to cut through the chocolate layer without just smashing the Nutella out. So I probably wouldn’t recommend trying it with Nutella. I’ve never used almond butter before so I’m not sure of it’s taste or consistency, but if you don’t mind almonds you could try that instead?? Thanks! I’ll try using almond butter instead 🙂 I hope they’ll work just fine. Someone brought these tarts to school, and I fell in love with them. They are delicious. I loved this tart and thank you for sharing your baking experience of it (and the recipe which I no longer had and found on your blog while searching for it). For me, Oreos were always a biscuit I’d eat when travelling as they weren’t available in my town way back then. I am still quite adamant that I should only ever eat Oreos when I’m in another country, although this recipe certainly calls for an exception! I, too, have found that Oreos are to be found in everything – as an ‘additive’. And, I agree, they are best as they were originally intended. I did make Oreo “truffles” last year for Christmas and dunked them in melted mint chocolate chips. Very yummy and decorative. 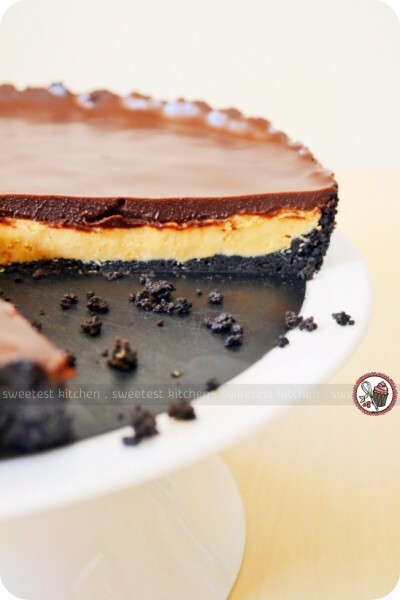 i have tried making a similar dessert and have trouble getting the cookie crust to stick to the peanut butter layer. It crumbles in the bottom of the pan…any suggestions? This looks scrumptious 🙂 I better try making a dessert like this soon!